In a decision that Ketchum business affiliates call the single most critical economic driver for the Wood River Valley, the City Council unanimously approved a third and final extension to Bald Mountain LLC’s development agreement Monday for a hotel project that’s nearly 10 years in the making. 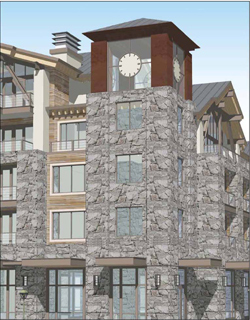 The proposed Bald Mountain Lodge on the south end of Ketchum’s Main Street would create more than 100 jobs locally, business partners say. The hotel’s most recent design iteration has 119 rooms and 19 condominiums. The luxury hotel would occupy the entire block on Main Street between First and River streets. Bald Mountain LLC received its development agreement for the project in September 2010 and has since received two extensions, due to the economic depression and resulting lack of available equity, according to a Sept. 12, 2014, letter from partner Steve Burnstead. The request asks for a building permit deadline of May 7, 2015, with construction commencing by November of next year. In considering the request, the city of Ketchum noted that the 2014 Comprehensive Plan came out in the meantime—and while the emphasis on tourism and economic drivers continue to reinforce the hotel plans, the plan also emphasizes the need for workforce and community housing. By waiving the housing in-lieu fees typically paid into the city housing fund, some $2.36 million wouldn’t be paid. With the Wood River Valley severely lacking affordable housing options, council members were concerned with where new hotel employees would live. This was weighed against the potential revenues generated by the hotel: local option taxes, building-related revenues, construction taxes and employees/visitor spending. Business partners James Garrison and Burnstead said at the Monday meeting that they’ve been engaged in talks with Colorado developer Aspen Group for 10 months. The one-year extension is favorable to the company, he said. “It’s a simple request and it’s vital to this particular developer coming to town, spending $60-plus million and all the extra economic boost that project would give to the city,” he said. Bald Mountain LLC sold the Aspen Group on the idea based on the original development agreement, he said, and that document needs to be intact going forward for the deal to work. The group would like to break ground next summer, Burnstead said. While the council mulled over the repercussions of continuing to waive housing fees, many local business owners spoke in favor of the extension. Justin Williams, publisher of Sun Valley Property News, said the arrival of a huge new employer could mitigate the loss of Scott Sports and Smith Optics in the valley. Bob Rosso of the Elephant’s Perch and Erik Vorm of Cornerstone Restaurant said local businesses could hugely benefit from the economic ripples a large Ketchum hotel project would generate. Harry Griffith, executive director of the Sun Valley Economic Development Group, said the project would have a direct economic impact of $64 million annually and would benefit Ketchum’s gross domestic product and job outlook. As per the terms of the council’s decision, the Aspen Group has an incentive to work quickly; the waived housing fees are partially reinstated if the May/November 2015 timelines are not met.